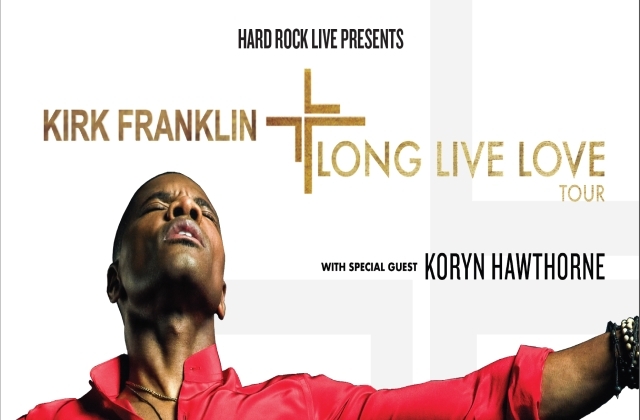 Kirk Franklin wants everyone to know one thing. He’s never going to stop pushing the envelope. Franklin’s latest musical offering—and 13th studio album—is the aptly titled LONG LIVE LOVE from his RCA-distributed label, Fo Yo Soul Recordings. But even before the album’s May 31st release date, its first single is already laying down some serious groundwork. “Love Theory” bowed at No. 1 on Billboard’s Hot Gospel Songs chart and has kept the position on lock for nine weeks. The vibrant track marked the singer’s record-extending seventh No. 1 and his second start atop the chart. With 1 million U.S. streams in its first week per Nielsen Music, “Love Theory” also opened at No. 1 on Gospel Streaming Songs as well as Gospel Digital Song Sales. Its colorful and energetic video has accumulated over 2.5 million YouTube views and counting. Among the other striking conversation-starters on the 10-track LONG LIVE LOVE are the introspective “Just for Me,” the insightful “Father Knows Best” and the cautionary “Idols.” As the very first song that Franklin wrote for the album, “Idols” is the hinge the album hangs. It addresses the issue of people placing too much emphasis on things like their careers, body image and money or on their service to God that sometimes becomes more important than the man himself. After culling through 50 to 60 song ideas, Franklin began collaborating with his fraternity of co-producers, Ron Hill, Shaun Martin, Max Stark and S1. And while his last album, 2015’s R.E.M-influenced Losing My Religion (GRAMMY Award winner for Best Gospel Album in 2017), boasted guest turns by gospel and R&B artists including Kim Burrell, Lalah Hathaway, Tasha Cobbs and Tamela Mann, Franklin opted to let music—a flavorful mélange of gospel, R&B, hip-hop and other influences—play the feature role on LONG LIVE LOVE. Celebrating his 26th career anniversary this year, the winner of more than 40 Stellar Awards and 16 Dove Awards is also busy pushing the envelope in other endeavors. Franklin brought his total GRAMMY tally to 14 at the 61st annual ceremony this year when Tori Kelly’s first foray into gospel, the Franklin-produced Hiding Place, won best gospel album. And “Never Alone,” the Franklin co-penned single from the album, was named best gospel performance/song. After its successful launch in 2018, Franklin’s Exodus Music & Arts Festival—in partnership with Live Nation— returns to Dallas for a second run on May 26th. It stars a lineup of established and emerging artists that includes Fred Hammond, the Clark Sisters, Travis Greene, Tasha Cobbs Leonard and Franklin himself. Between that and ramping up for the LONG LIVE LOVE Tour in July, Franklin will once again executive-produce and host the ninth season of BET’s top-rated musical competition series Sunday Best. In addition to helming Kirk Franklin’s Praise channel on SiriusXM, the multi-tasker is developing projects under his Fo Yo Soul banner.